Best mountain bike shoes are pretty hard to find, don’t you agree? This sport requires top-shelf gear as it’s laden with dangers, and settling for inferior quality might ruin your biking experience in more ways than you can imagine. Some people go as far as saying that mountain bike shoes are, perhaps, even more important than the bike itself – you’ll pedal your way up and about those cliffs, and providing proper support to your heels and ankles will mean a lot by a long shot. We’ve prepared a list of the best mountain bike shoes you can get for the buck. So, all you need to do is kick back, relax, and take your pick. 1. Don’t decide solely based on your budget – sometimes being patient pays off. If you’ve managed to save up $50, there are MTB shoes you could buy, but there are models that will bring you more comfort and flexibility for $10 extra. 2. Comfort is imperative – blisters will be the least of your worries if you pick uncomfortable shoes. 3. Material is important – suede, leather, textile. There are numerous types of materials, and while some people like this, others like that. You need to decide what’s best for you. 4. Gratis goodies – some mountain bike shoe models come with complementary features, for example cleats. Passing up such a good opportunity is not what we’d advise. 5. Velcro straps – make sure your MTB shoes have straps instead of laces. You don’t want to risk a loose lace getting between your bike’s tires at high speeds for obvious reasons. 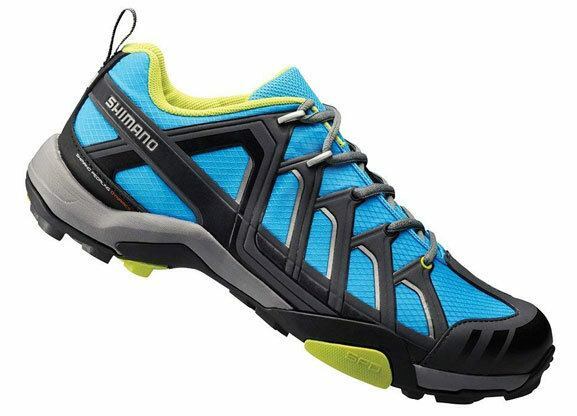 The first mountain bike shoes we’re reviewing are Shimano’s SHMT34B men’s shoes. When compared to our other picks, this model is among the most affordable ones. It looks flashy and stylish, and come outfitted with stretch-resistant mesh materials reinforced with synthetic type of leather. The midsole is also reinforced with polyamide glass fiber which provides excellent durability. If you are looking for a quality pair of MTB flat shoes, this one boasts a huge value for the buck. Shimano’s SHMT34B might not be the best mountain bike shoes ever built, but they’re actually pretty close. It's pretty affordable, look excellent, and boast a high level of sturdiness. The only problem is that they are intended for two-hole MTB style cleats – you’ll need to remove them if they start to feel uncomfortable. 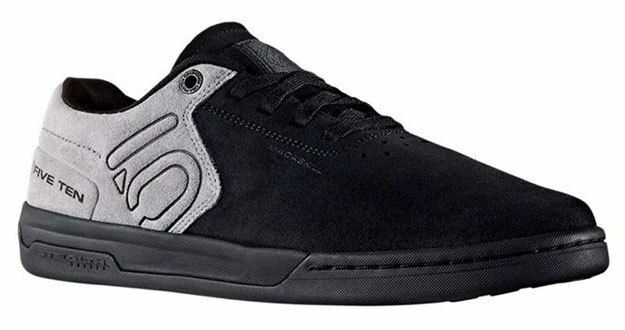 Next up on the menu is Five Ten Danny MacAskill’s mountain bike shoes – a beautiful, elegant set of shoes which are durable, easy to maintain, and look absolutely exquisite. First of all, these MTB shoes are made of suede leather materials – they feel pretty nice and comfortable, looking great all the while. The EVA midsole provides excellent shock absorption as well as anatomical support to wearer’s feet, bet the overall feature outfit is pretty simplistic in truth (there are no fancy accessories, unlike with some models we’ve included in this review). Danny MacAskill’s mountain bike shoes come in three color variations, including black & gray, carbon black, and grey stone. In truth, Danny MacAskills’ MTB shoes are elegant and sturdy, but they cost an arm and a leg. In fact, if we compare them to Shimano’s mountain bike shoes (our previous pick), you’ll notice that they cost roughly twice as much. They do, however, boast quite a value for the money. 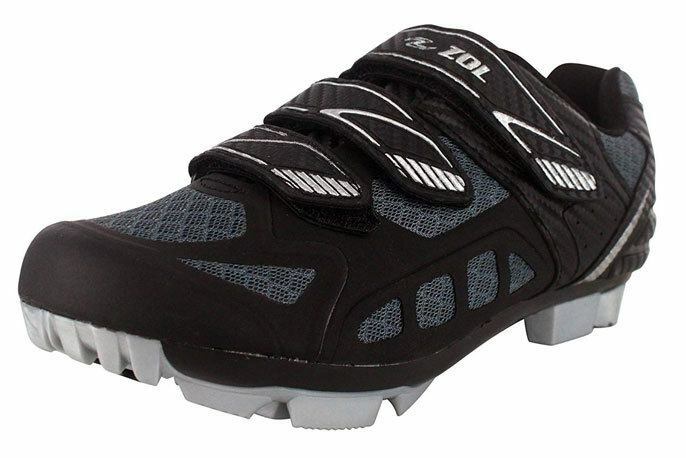 Zol Predator MTB shoes are among the best we’ve come across. They belong to the medium bracket of the “moderately expensive” price point category, and they look pretty awesome, don’t they? They come outfitted with three carbon-fiber Velcro straps that promote maximal security of the wearer’s feet – easy to use and reliable, these straps will save your feet and toes. The sole of Zol’s Predator features injected fibreglass nylon material which ensures shoe’s frigidness while you are pedalling, which you’ll find as rather comfortable, even on longer rides. These shoes are also pretty lightweight, weighing only 346 grams in total (0.7 pounds). If you are looking for pretty MTB shoes, Zol’s Predator might be perfect for you. These shoes are sturdy and fashionable, but what we liked the most about them is the fact that they come outfitted with high-end features, such as carbon fiber velcros and injected fibreglass nylon sole. They’re also very cheap, and among the most affordable MTB shoes in our review. Here we have something different from what we’ve seen so far – Venzo’s Shimano SPD shoes with cleats look absolutely ravishing and promise much in terms of quality and performance. To top it all off, they’re also very, very affordable, as they belong to the medium bracket of the moderately affordable price point category. Venzo’s SPD shoes are made of quick-drying mesh materials combined with ultra robust synthetic materials. The lining is removable and features textile materials while the low-cut design ensures optimal performance and comfortable feel at all times. They’re compatible with all Shimano SPD systems and are flexible enough to accommodate all types of feet. What’s more, you will also get Shimano SPD cleats as complementary features, totally free of charge. Great for the buck, it’s as plain as that. 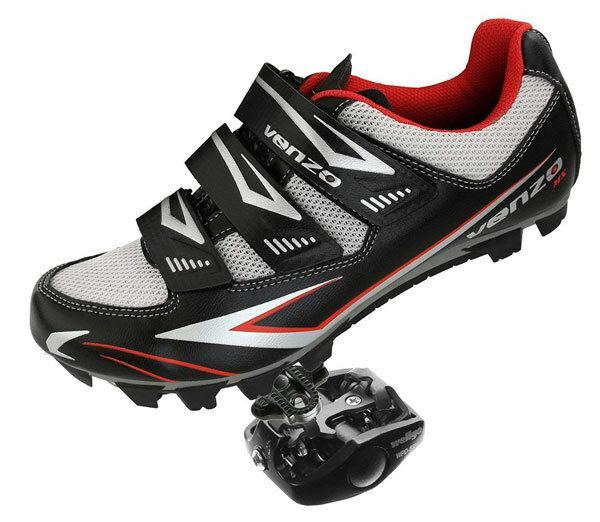 Venzo’s Shimano SPD MTB shoes are incredibly comfortable, protective (Velcro straps and outer reinforcements are enough to keep your ankles safe from all harm), and they’re pretty inexpensive altogether. So, if you’re looking for cheap MTB shoes that excel in several fields of performance, this pair’s your best bet. 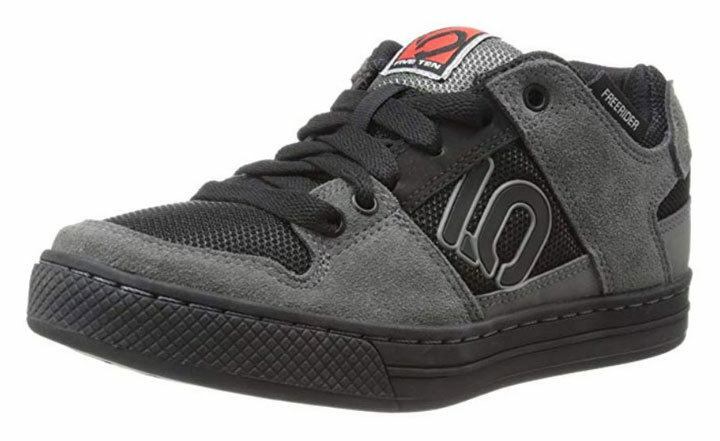 We’ve already seen what Five Ten can do with their Danny MacAskill MTB shoes, but in case you didn’t like that model in particular, we present to you the Freerider MTB bike shoes. In essence, these are elegant, light MTB shoes that come in ten color variations, including teal/grenadine, dark grey/orange, green/gray, matte black/green, brick red, and more. They’re made of leather and synthetic materials – some of the fields of performance these shoes excel the best are comfortability, durability, and ankle protection. They feature S1 rubber outsole which keeps the feet glued to your bike’s pedals at all times. Now the upper is made of mesh and suede materials and feels slightly more comfortable than the heel and feet areas – these shoes promise much in terms of friction and comfort. Looking good and feeling good – if that’s your motto, we encourage you to try out Five Ten’s Freerider MTB shoes. They’re slightly more expensive than Shimano’s MTB shoes but still pack quite a value for the money. Giro’s Rumble VR MTB shoes are among the classiest we’ve come across. They boast full-leather construction and weigh approximately 425 grams (0.9 pounds), which means that they’re as durable as they are light. They might not be the cheapest mountain bike shoes out there, but they’re certainly not the most expensive. Boasting molded shank and optimized cleat zones, you’ll come to rely on Giro’s Rumble in no time. 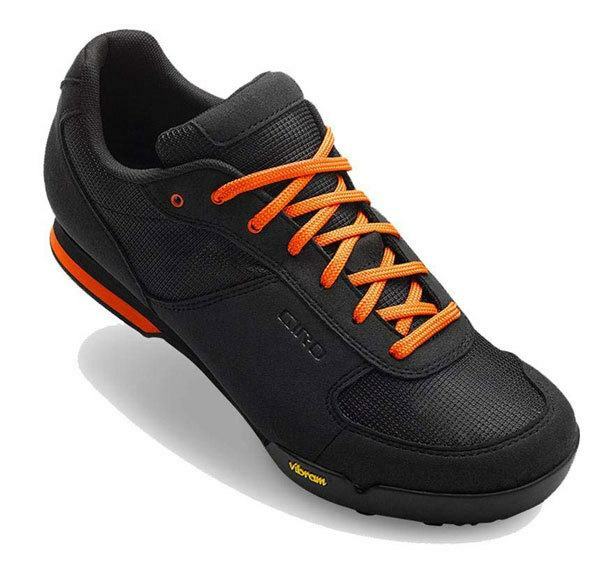 When you’re looking for comfortable mountain bike shoes, you don’t want to skip on Giro’s Rumble. These shoes simply provide the best feel while compromising nothing in terms of other spheres of performance. Some of the most important features of these shoes include breathable mesh-laced closure, EVA midsole, and ecostep rubber outsole. We’re closing down the curtain with Gavin’s MTB shoes. Now, you’ll notice that these mountain bike shoes are the cheapest pair we’ve had in our review. Even though they don’t cost as much as the other models, they’re not to be trifled with – they feature a perforated insole, carbon-fiber hook & loop straps, fibreglass nylon sole, and 2-bolt cleat compatibility. Overall, even though they’re cheap, they could easily dance toe to toe with other more expensive mountain bike shoe models. 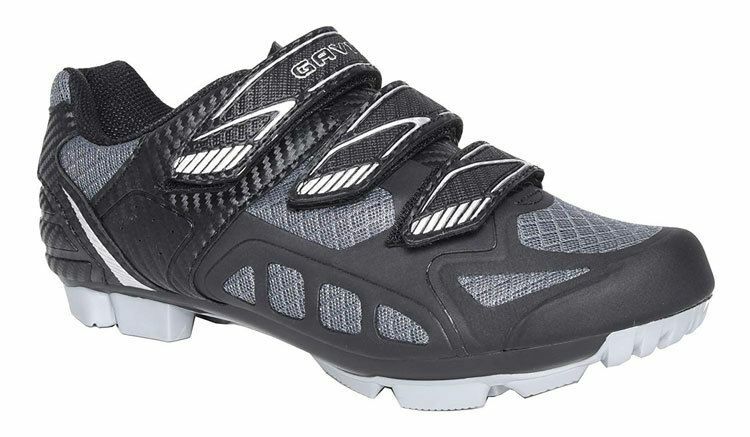 Lightweight, comfortable and cheap – if that’s what you are looking for, Gavin’s MTB shoes are absolutely ideal for you. They sport a massive value for the cash and we highly recommend that you give them a shot. Now that we’ve seen what some of the best mountain bike shoes are, it’s up to you to make the final verdict by choosing the pair you think is the best for you. Some MTB shoes are inexpensive, others are more comfortable while there’s a single thing that makes them all “best” in their own way. Each of the models we’ve mentioned in the sections above sports a great value for the money. You can rest assured that there’s no “bad choice” here – it’s just that different shoe pairs excel in different spheres of performance. Regardless, we wish you all the luck in finding the best mountain bike shoes for the buck!